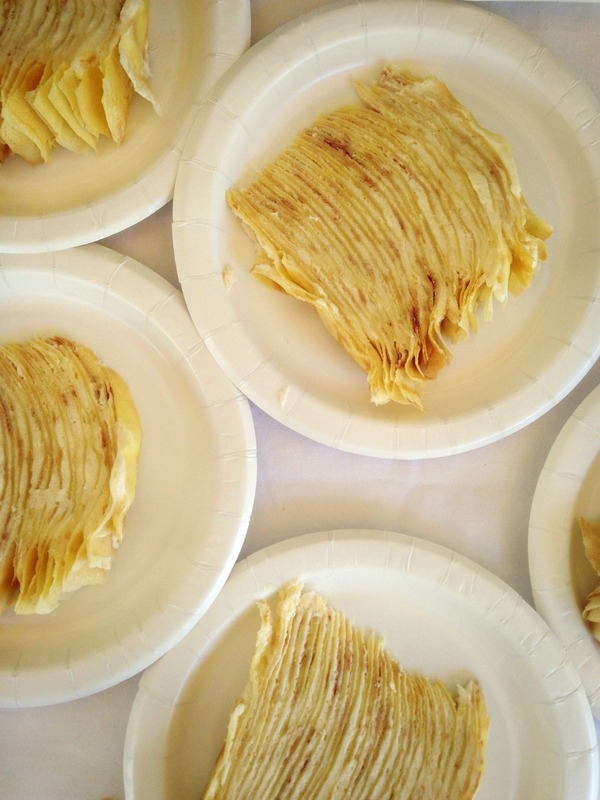 Ok guys, the next time you have hours in the kitchen, maybe an afternoon to stand idly near the stove making crepe after crepe – make this unforgettably delicate crepe cake. I don’t know if I have ever been more proud of a start to finish food project as I was of this (…well maybe my Moroccan Bastilla pie but that’s for another time and another blog post…). It wasn’t that it was difficult to make more so than it was just time consuming. It is more than worth it though and such a treat to prepare, bring together and share with friends. The occasion this particular day was Mother’s Day and I wanted something special to showcase in the Mother’s Day brunch I was cooking for other than the standard fruit tart, lemon bar or carrot cake. It definitely made a statement and was a perfect picturesque item in the middle of the brunch table-scape. ended up being my initial inspiration and reference for the base crepe recipe and technique. Her cake came out beautiful, no? I did end up tweaking the filling slightly to suit my personal preference by adding a little less mascarpone and folding in more whipped cream and lemon curd to give a stronger lemon flavor. Some points to note when taking the crepe cake plunge. It is so, so important that you use a non-stick Teflon pan. Various kitchenware and online stores sell crepe pans but a simple shallow sauté pan will do the trick. I used an 8” pan and made around 60 crepes doubling the suggested crepe recipe and monitoring the heat level on my stove being careful to not let the crepes get too dark or cook to fast. Once finding the sweet spot between heat and crepe making, the rest was a breeze. It was important to my presentation that the cake stood tall and not one crepe was left unused. The size and height was actually quite perfect. Leave some room around the edges so you create that gorgeous ripple effect and continue to layer. Crepe, Mousse. Crepe, mousse. Crepe, mousse. At some point soon enough I will discover another reason to recreate this beauty. Perhaps next time though, a chocolate crepe with peanut butter mousse and caramelized bananas? Or since we are on our way to that holiday season, a vanilla spiced crepe layer with spiked egg nog cream? Your thoughts? Let's inspire each other!